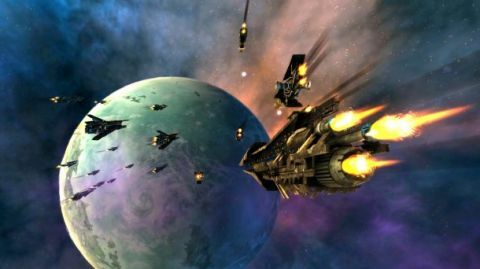 A space strategy game that streamlines empire-building better than any other. Combat and AI could be better. This is a 4X strategy game – which sounds a bit like a punch-up fuelled by crappy beer. In fact, the four 'X's stand for the classic principles that underpin this particular offshoot of the genre: explore, exploit, expand, and everyone's favourite – exterminate! Endless Space focuses on macro-management rather than down-and-dirty detail-fiddling. It makes galactic control streamlined, helped enormously by the slickest interface this type of game has ever seen, a beautifully designed UI that keeps things only one or two clicks away. It feels good just to fiddle with. The overall focus of your empire, from what direction the tech is moving to what each system is producing, is all present on the main galaxy view, so a quick glance at the beginning of each turn tells you where everything stands. It's a great achievement, even though there are inevitably one or two things nested away in counter-intuitive places: unlocking ship designs, for example, only unlocks the hull, which you have to incorporate into a custom build before production. The feel of the game flows from this uncluttered interface. Playing as one of eight races (or building your own by pick-and-mixing attributes), the choices are good old-fashioned warfare, an economic victory, a scientific victory, an expansion victory or the rather odd 'Supremacy' victory of taking over the other races' homeworlds. Bit unappetising, that last one. The mechanics are always the same: fly colonies to other star systems, exploit them, develop tech, and deal with other players. It's the resources that make the difference: science for tech, food for population, industry for production, and the magical currency of Dust. Strategic resources are sprinkled around that you can't detect without a bit of teching, and these are crucial to certain playstyles. Military types, for example, want Titanium-70 for construction of their battlefleets. After a few games, you realise the most important thing is... everything. Tiny advantages can become the pivot on which the fate of empires turn, and wasted production cycles never come back. The AI varies: the military and expansion-focused races are by far the best singleplayer thopponents; races intended for diplomacy or teching victories don't work so well, just asking for free resources and trying to form alliances willy-nilly. Those more subtle wins aren't unattainable, it's just that the AI feels too clumsy to carry them off. In multiplayer it's different, although there games take so long that many matches end up abandoned by all but the early leader. The one thing I didn't like is the combat: a rock-papers-scissors series of choices followed by a cutscene result. The unskippable videos are beautiful the first couple of times, but rapidly pall. Your only option in the late-game is to set battling to automatic rather than manual, or sit through 20 in a row. Nevertheless, this has the foundations of a great game, and judging by the devs' willingness to incorporate community suggestions, it will get even better. If you're all about space battles, it doesn't quite deliver. But anyone who's a fan of backroom deals, the exploitation of natural resources, and the crushing of all who defy you, will find Endless Space is their kind of universe.